The cash dividend represents a dividend pay-out of circa 46%. 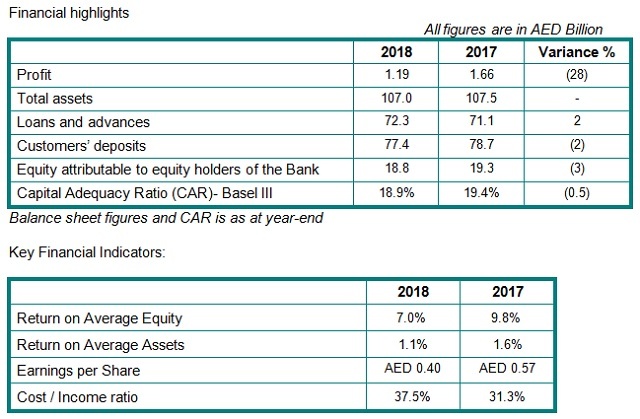 Union National Bank (UNB), one of the UAE’s leading local Bank held the Annual General Meeting of its shareholders on 21 March 2019 in Abu Dhabi. In the meeting shareholders of UNB approved to distribute cash dividend of 20% or AED 0.20 per share. The cash dividend represents a dividend pay-out of circa 46%. UNB reported a net profit of AED 1,186 million in 2018, decrease of 28% as compared to the prior year. The operating profit for UNB was AED 2,070 million for the year 2018, lower by 17% over the last year due to a reduction in operating income by 9% in 2018 to AED 3,312 million. Net loans and advances were AED 72.3 billion as at 31 December 2018, higher by 2% year-on-year basis whilst customers’ deposits decreased by 2% to AED 77.4 billion as at 31 December 2018. In the Annual General Meeting, the shareholders have also approved the proposed merger of Union National Bank PJSC and Abu Dhabi Commercial Bank PJSC (ADCB). The Merger will result in New ADCB Shares being issued to UNB Shareholders on the following basis: for each UNB Share: 0.5966 New ADCB Shares corresponding to a total of 1,641,546,697 New ADCB Shares to be issued to existing UNB Shareholders.